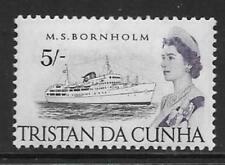 Tristan da Cunha 1954 definitives, part set SG14-24 mint, lightly hinged. The 1960 Pre-Decimal QEII Issue depicting Scenes around the islands. Short Set with values to 1/-. Mint Lightly Hinged and very fresh. Short Set with all values to 1/- from the KGVI issue of 1952 of St Helena overprinted for use on Tristan da Cunha. TRISTAN DA CUNHA SG26 1954 5/- BLACK & RED-ORANGE. A FINE LIGHTY MOUNTED MINT STAMP. Good condition set of Tristan Da Cunha. It is the 1972, Flowering Plants set. 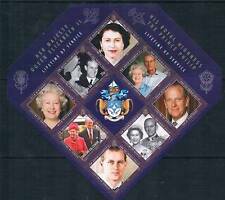 TRISTAN DA CUNHA SG83 1965 5/-BLACK & VIOLET. A FINE MOUNTED MINT STAMP. Scan shows the item for sale unless otherwise stated. 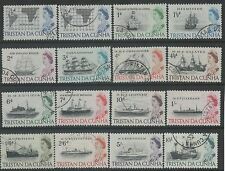 Good condition set of Tristan Da Cunha. It is the 1971, 1/2p - 50p Decimal Currency set. TRISTAN DA CUNHA SG66 1963 5/- YELLOE BROWN & GREEN. A FINE MOUNTED MINT STAMP. The 1960 Pre-Decimal QEII Issue depicting Fish found in the waters around the island. Short Set with values to 1/-. Mint Lightly Hinged and very fresh. Good condition set of Tristan Da Cunha. Mint Lightly Hinged and fresh. Li gh t mo un t mi nt with mi no r br ow n sp ot s to Perf See Pics. TRISTAN DA CUNHA Queen Elizabeth II 1963. From the range SG 55 to SG 67. MINT Very Lightly Hinged - Full Original Gum. Add to Favourites. TRISTAN DA CUNHA 1974 ROCKHOPPER PENGUINS SET lightly hinged Dispatched with Royal Mail 2nd Class Letter. Short Set with all values to 10c from the QEII issue of 1960 depicting Marine Life found in the oceans around the island. Tristan da Cunha: Fish, sea-life, definitive set, Mint lightly hinged. Mint lightly hinged. Catalogue Price: £75. Lightly hinged mint, see reverse scan. Catalogue Price: £80. A FINE MOUNTED MINT STAMP. We only accept cheques in £ sterling. TRISTAN DA CUNHA 1960 LOW VALUE DEFINITIVE 5d SG,35 MOUNTED MINT NICE AND CLEAN CONDITION. TRISTAN DA CUNHA SG641963 1/6 GREY BLACK & SLATE BLUE. A FINE MOUNTED MINT STAMP. Mint Lightly Hinged and very fresh. TRISTAN DA CUNHA 1952 GEORGE 6TH 4d ULTRAMARINE SG,6 MOUNTED MINT NICE AND CLEAN CONDITION. TRISTAN DA CUNHA 1952 GEORGE 6TH 8d OLIVE-GREEN SG,8 MOUNTED MINT NICE AND CLEAN CONDITION. TRISTAN DA CUNHA 1952 GEORGE 6TH 6d LIGHT BLUE SG,7 MOUNTED MINT NICE AND CLEAN CONDITION. TRISTAN DA CUNHA SG82 1965 2/6 BLACK & ORANGE BROWN. A FINE MOUNTED MINT STAMP. TRISTAN DA CUNHA 1960 MID VALUE DEFINITIVE 1/- SG,38 MOUNTED MINT NICE AND CLEAN CONDITION. Wait for our final invoice. GV1 1952 1s. sepia sg 9 lightly hinged mint. Good condition stamp of Tristan Da Cunha. It is the 1952, 8d Green stamp. Good condition stamp of Tristan Da Cunha. It is the 1952, 1s Brown stamp.